In research on Bircza, I have come across many useful lists of residents, survivors, and more. These lists are of great use to genealogists and other researchers. I have organised as best I can and posted them here. Browse the lists by using the index at right, rather than scrolling down, since some of the lists are larger and are located on separate pages. Some, like the commerce listings, were donated graciously by various individuals, whom I thank for their kind help. Likewise, if you have information, please share it with the rest of the Bircza researcher community by contacting me. This is a list of eligible Jews who could participate in elections for the staff of the Bircza Jewish community in 1904. Jacek Proszyk has graciously contributed and transcribed this list. 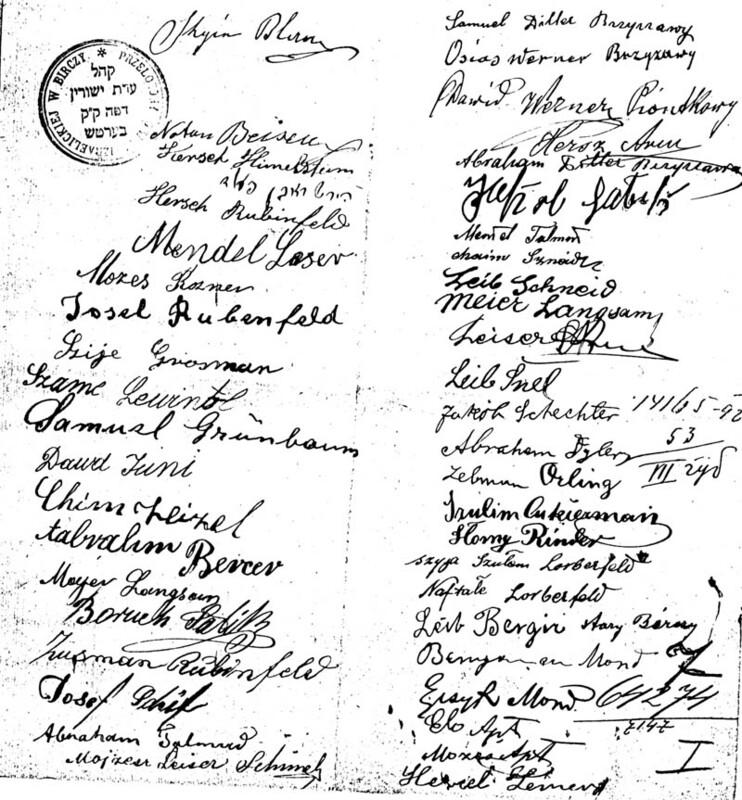 This list consists of signatures of various members of the Bircza Jewish community, although the document to which they appended their signatures is missing. Although there are some numbers at the bottom-right of the page, I have sofar been unsuccessful at decyphering their meaning (perhaps a specific date) and would appreciate any suggestions. Below, I have transcribed the signatures, as they appear in the document (not alphabetically). Of course, given the nature of signatures, it was not easy to transcribe all the names, and I have marked the names that presented me with particular difficulty with a question mark (?). You can view the document yourself, by clicking here. This list has been graciously contributed by Jacek Proszyk. Hersch Rubinfeld Abraham D?iller Biryrzowa? * This Russian abbreviation (губ) transliterates as ‘gub’. Generally the abbreviation ‘g.’ (г.) indicates ‘year’, however, губ means ‘lip’, making the meaning unclear. This list notes the Jews from the Bircza area who contributed funds (‘taxes’) for the Bircza Jewish community budget. Jacek Proszyk graciously contributed and transcribed this list. To contribute information or make contact with Bircza Online, please use this form below, or email bircza@reproots.org. Are you interested to join the Association of Bircza Researchers (ABR)? Select a village from the list to visit an interactive map of the entire Bircza area.